Other participants of this panel will discuss Cuba’s balance of payments. This paper does not address how the trade gap is met, only the remittances issue. However, you are referred to Table 5 in Jorge Pérez- López’s paper.1 Between 1993 and 1998, the cumulative trade gap reached US$10.1 billion. How can a country finance such a deficit having no foreign exchange reserves and having defaulted in its foreign debt with the Paris Club since 1986? Like the 20,000 murders attributed to Batista, the 20,000 prostitutes under the previous regime and the 20,000 homosexuals in the Mariel exodus, this amount of remittances became another mantra for Castro’s friends. Further stories worldwide quoted the US$800 million in remittances until it became cast in concrete. By August, 2000, the figure has been raised to one billion dollars. For purposes of this discussion, we will stick to the $800 million figure. The same logic, but even with greater justification, applies to the one billion dollar level. It is true that overseas Cubans are remitting money to their families and, in my opinion, rightly so. However, as will be shown in this paper, the US$800 million remittances estimate is mathematically impossible and politically unfeasible. This is a cynical manipulation to cover a most unpleasant truth: Castro is resorting to drug trafficking and money laundering to finance the balance of payments gap. The source quoted for the US$800 million figure was an Economic Commission for Latin America and the Caribbean (ECLAC) study on the Cuban economy. Any question raised on the validity of the amount was brushed aside by referring to the supposed credibility and impartiality of the source: a United Nations agency. In the first place, ECLAC needs governmental approval to release a report. And the Cubans are very demanding before giving their approval. Besides, for its own reasons, ECLAC has always conveyed a rosy view of the Cuban economy in its reports. These reports are based on data provided by the Cuban government. Rather than questioning the accuracy of the data provided by Cuban officials, ECLAC specialists have always been willing to provide the Cubans the mantle of credibility of an UN agency. As will be commented further below, the mentioned report is no exception. In the remittances case, efforts to obtain documentation on how the US$800 million figure attributed to ECLAC was arrived at met with a wall of silence. ECLAC spokesmen in Washington and Mexico claimed the report was on hold until its official release; which, in turn, was waiting for its publication in book form by the Fondo de Cultura Económica, a left leaning publishing house in Mexico City. How, under this publication hold, the key figure on remittances was released by ECLAC to become the most important fact related to the report worldwide—to be quoted by Mr. Preeg and many others—is left to the imagination of the reader. All we know is that the remittances estimate was legitimized by ECLAC, as a source, long before the study became public. ECLAC’s spokesmen were unable or unwilling to provide any explanation. Meanwhile, Castro has been enjoying a propaganda windfall. Why are the Cubans inflating the contribution of the hated exile community to Cuba’s balance of payments? The most logical answer is that such a figure offered an excellent cover for the drug dealings and money laundering that are going on through Cuba. It is unlikely that ECLAC officials deliberately provided a story to cover for Cuban drug trafficking and money laundering. They were simply “useful idiots,” to borrow Lenin’s delightful label for Communist sympathizers. The source of the leak is probably some Cuban government official. We will concentrate our efforts on the remittances and on a more realistic explanation of how the trade gap is being financed. In the first place, there is absolutely no documentation or explanation in the report of how the US$800 million figure was arrived at. Mention of the estimate are made in passing in the text without providing any detailed basis for the calculations. 3 One would have expected from ECLAC a more thorough analysis of how the estimate was arrived at. Particularly in view of the fact that Pedro Monreal, a Cuban government researcher, has revealed there are several studies on this matter. In an article published in Encuentro,4 Monreal reports that those studies provide much lower estimates of between $300 to $400 million dollars. Regardless of that, he quotes the ECLAC report’s US$800 million figure as if it were based on some serious estimate, although mentioning that his own estimate is closer to US$500 million. Unfortunately, in the rest of the article, which incorporates very interesting speculations, there is not a single table or statistical fact. What makes ECLAC’s credibility even more doubtful are the figures released by Cuba’s Banco Central, which differ substantially from those given by ECLAC. In 1996, for example, the Banco Central reports Net Current Transfers amounting to US$743.7 million, while ECLAC reports US$1,112.0 million, a difference of more than US$350 million. Having expressed our doubts about the reliability of their estimates, in this paper nevertheless we will start from what ECLAC asserts is the amount of remittances received and then try to validate its feasibility, first from the perspective of the overseas Cuban community, and second from the perspective of the impact of those transfers from abroad on Cuba’s distribution of wealth and its social and political consequences. Then, some comments will be made on a possible source for the substantial financial resources entering Cuba outside conventional trading and financial exchanges: namely, drug trafficking and money laundering. Among the various sources of information for that section of the paper, the most important new one is the forthcoming Narcotráfico y Tareas Revolucionarias, a report by Norberto Fuentes on the activities of the de la Guardia brothers and General Arnaldo Ochoa to be released sometime this fall by the Center for a Free Cuba. Finally, building on ECLAC’s statistical information on tourism investment, an analysis will be made of some of the issues relevant to the hypothesis raised in this paper as to the real sources of the funds for which remittances are being used as a cover. In particular, attention will be given to the massive tourist investment reported in the ECLAC report and how it may be financed through money laundering. In this respect, it is worth mentioning that in the notes presented at this panel by Emily Morris, of the Economist Intelligence Unit, she states that “the net direct investment figure does not seem to truly reflect flows of foreign direct investment. Responses from the Central Bank suggest that much tourism investment is excluded from this category, as the reporting lines from tourism corporations are atypical.”5 As our hypothesis below reveals, the sources may be atypical indeed. CAN OVERSEAS CUBANS REMIT US$800 MILLION A YEAR? The total number of immigrants has not changed significantly since 1994. The tens of thousands of raft people and the legal immigrants on visas granted under the U.S.-Cuba migration agreement—who obviously will have the highest motivation to remit to their immediate families left behind—are not enough to change the quantum of immigrants significantly. Furthermore, although in their case there is probably a higher commitment to remit than among earlier immigrants, most of these new arrivals are at the bottom of the income scale. In order for US$800 million to have been remitted to Cuba, about 200,000 Cuban Americans had to send US$4,000 each to their families in Cuba during that year; or, 400,000 had to send US$2,000 each; or, 800,000 had to send US$1,000 each; or some other such combination. There are no formal reports available to determine actual volume of remittances. To get an idea of which of these number is the most realistic we can draw on demographic data from a poll on Cuban public opinion, which included one category related to monthly remittances received in their homes. The poll was undertaken by the University of Florida, Gainesville, and financed by the USAID Cuba Program. The results are given in Table 1. 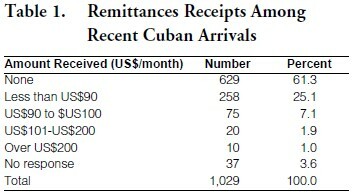 Table 1 reveals that 629 of the sample of recent Cuban arrivals, or 61.3 per cent, reported not receiving any remittances at all from abroad. The second largest group, with 258 respondents, or 25.1 per cent, reported receiving less than US$90 a month. There were 75 respondents, or 7.1 per cent, who reported receiving monthly remittances of between US$90 and US$100 and, finally, 20, or 1.9 per cent, reported receiving between US$101 and US$200. Only 10 respondents reported remittances of over US$200 per month. Since these recent arrivals were more likely to have relatives abroad and receive remittances than the rest of the population, it is reasonable to assume that the level remittance receipts for the Cuban population as a whole is likely to be even lower. Therefore, the most solid first hand information available on average remittances, based on a poll of a significant number of recent residents of Cuba, indicates that close to two-thirds receive no remittances at all and, of those receiving remittances, the overwhelming majority obtain a little over one thousand dollars a year from their relatives abroad. With such a level of remittances, it would be necessary to have almost 700,000 exiles making remittances to attain the US$ 800 million total. This is mathematically impossible, as will be demonstrated with U.S. Census data. 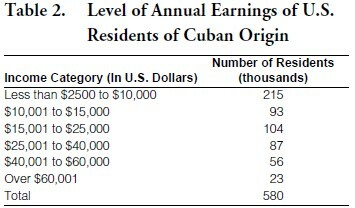 According to the March 1996 Current Population Survey, the absolute number of U.S. residents of Cuban origin 15 years of age or over, 580,000, is substantially lower than the 700,000 required to make remittances at the rate of US$1,200 a year to reach a level of US $800 million dollars (Table 2). As to the assumption that every resident would be making remittances, this is highly unrealistic. The fact is that, according to Current Population Survey, 412,000 out of the 580,000, or 70 per cent, earn less than US$25,000 a year, which does not leave much disposable income to remit. It is possible that household income, combining more than one income earner per family, may allow for more disposable income for remittances. However, to the extent income is pooled so that household income is higher, the absolute numbers of potential senders of remittances decrease. In view of these sobering numbers, the claim that in 1996 Cuban-Americans remitted US$800 million and in 1997 US $1,000 million to their families in Cuba, as is claimed, is just not realistic. CAN CUBAN SOCIETY ABSORB US$800 MILLION IN REMITTANCES? When these numbers are analyzed from the point of view of their impact within Cuban society and internal political forces, the conclusion is that these magnitudes are equally unrealistic. In any society, the distribution of income is related somehow to class levels. Even in supposedly socialist classless societies, where ownership of the means of production is abolished, economic rewards and privileges are distributed according to status within the nomenklatura. From that perspective, we can also look at the impact of the estimated remittances levels against some macro and micro magnitudes. For that, we will draw on the ECLAC report. Present rules allow Cubans to exchange their remittances at the rate of one dollar per twenty pesos to pay taxes, make purchases or open bank accounts. In these last two cases, however, remittance recipients have the option of buying directly in dollars or opening dollar accounts. According to the ECLAC report, the Tiendas de Recuperación de Divisas (Foreign Exchange Recovery Stores, TRD) reported 627 million dollars in sales in 1996 to all groups of buyers with access to dollars. That is, in addition to those receiving remittances, this figure includes purchases by tourists, by joint ventures staff with access to dollars or credit cards, and by Cubans getting dollars through self-employment or the many special salary arrangements allowing for payments of a portion in dollars. These other TRD customers are likely to account for several hundred million dollars in purchases. Government exchange houses only reported exchanges for US$5 million and dollar bank deposits amounted to only US$2 million.7 This accounts only for the final destination of a total of 634 million dollars. Therefore, if actual remittances amount to eight hundred million dollars, that amount exceeds the total receipts of the three destinations reported by ECLAC. In conclusion, we are left with no explanation as to the destination of whatever dollars are generated by remittances at the level reported by ECLAC. At the same time, if actual remittances were substantially lower, reconciling the level of remittances with other macroeconomic aggregates in the Cuban economy would be easier. At the macro level, US$800 million are equivalent to 16,000 million pesos, using the exchange rate of 20 pesos to one dollar prevailing in the unofficial market. The figure of 16 billion pesos can be compared to the GDP of 25,197 million pesos and to the 18,800 million pesos of private consumption estimated in the ECLAC report for 1996 to get an idea of the concentration of buying power they represent. Granted these are value added figures. Nevertheless, this level of remittances would reflect a very high concentration of wealth in the hands of enemies of the revolution, or at least disaffected elements. Furthermore, for a small segment of the Cuban population to have such a share of total buying power within Cuban society undermines the egalitarian claims in the ECLAC report. The fact is that access to dollars has divided Cuba into two societies, creating a dual economy where economic Apartheid prevails. The figure of 16,000 million pesos attributable to remittances represents, in turn, more than 133 percent of total government revenues of 12,124 million pesos in 1996. In other words, this group of relatives of the bitterly anti-government overseas Cubans has buying power far in excess of that of the state. Evidently, were these figures to be true, there would be a very perverse relation within Cuban society between political power and economic power. It is highly unlikely that Castro can ignore the resulting unhappiness of his followers over this situation. A parallel situation reveals how sensitive the Castro regime is to this issue. Foreign investors are forced by law to pay salaries in dollars to Cuban government companies that provide them their workers. The government companies pay the workers on an even dollar for peso rate, that is way below the market value of twenty pesos to the dollar. At present, some midway arrangement is made to reduce the impact of such a confiscatory exchange rate practice. Castro’s economic spokesmen who have come to the Cuba Project at Georgetown University, justified the policy of paying salaries in Cuban pesos at a one peso equivalent to one dollar exchange rate to the 60,000 joint venture workers on the grounds of equity to the rest of the Cuban labor force. The same logic applies, probably with more political justification, to the relatives of overseas Cubans. Now, how will these loyal party cadres react when they see around them the relatives of the overseas Cuban community enjoying transfers, rather than earned income, amounting to multiples of what they earn for their work? To get an idea of the magnitudes involved, to reach the US$800 million macro level, it would be necessary, for example, for 200,000 remittance receivers to get an average of 80,000 pesos per year; or, for 400,000 to receive an average of 40,000 pesos per year; or, finally, for 700,000 to receive an average of 24,000 pesos per year. The impact of such massive disparities in income between remittance receivers and party loyalists would be highly destabilizing of the internal political situation. Castro would be forced—as he did in 1986 when he closed the Free Peasant Markets in response to complaints by party cadres—to put an end to the remittances or introduce a less disruptive exchange rate. If he did so, there would be an uproar and the willingness of people to send money would be substantially reduced. No, Cuba could not maintain internal social peace if it was really receiving such levels of remittances. The story is just not credible. The above sections demonstrate in a better documented way than any of the estimates provided by the regime that neither can the exile community remit that much money, nor can the Castro regime tolerate the distortion in the allocation of economic rewards between its supporters and its enemies entailed by an US$800 million level of remittances. The question then is, why is the claim made? The most plausible explanation is to cover-up the income generated by drug trafficking and money laundering. This requires some background on Castro’s links with drugs. Castro’s links to drugs go back to the time when he was in the Sierra Maestra. When he survived the disastrous landing of the Granma in 1956, the first local protector he had was Crescencio Pérez, a local peasant “capo” who controlled production and marketing of many crops, including marijuana. When some of the revolutionaries realized who their savior was and complained to Castro, he told them that for the time being they had to depend on him. Such issues would be dealt with afterwards. Later on, Crescencio became a peasant revolutionary hero. Once in power, Castro was not, and still is not, averse to associate with drug or any illegal or unsavory activity as long as it helps him stay in power. There are four drug cases involving Cuban officials at the highest level which have resulted in U.S. grand jury indictments. In 1982, four high ranking Cuban officials were indicted by the Guillot Lara Grand Jury for arranging a drug smuggling operation through which drugs were brought into the United States in exchange for smuggling weapons to the M-19 guerrilla movement in Colombia, which was being supported by Castro. The officers indicted included Admiral Aldo Santamaría, who was the Cuban Navy Chief and a close Castro collaborator; Fernando Ravelo, Ambassador to Colombia and later to Nicaragua; René Rodríguez Cruz, President of the Cuban People’s Friendship Institute, a close Castro collaborator, since deceased; and, Gonzalo Bassols, a Cuban diplomat accredited to Colombia at the time. The most important of them in terms of relevance to the issue under discussion is Admiral Santamaría. He was a member of the Honor Tribunal condemning General Arnaldo Ochoa! One of the central events in the Noriega indictment and trial involved Castro’s mediation between Noriega and the international drug cartel over the seizure of a cocaine laboratory in Panama which Noriega had allowed to operate there in exchange for a payment of US$4 million. According to the indictment, Noriega traveled to Cuba on June 27, 1984, at Castro’s request, on his way back from Paris. Castro offered his good offices to settle the disagreement between the drug cartel and General Noriega. A mediator role requires good relations with the drug lords. Good relations that extend to the present. In 1989, Robert Vesco was indicted by the Carlos Lehder Grand Jury in Jacksonville, Florida for arranging safe passage for drug planes over Cuban air space. According to the indictment, Vesco obtained approval from Cuban authorities for this arrangement. Later on, in an interview over Radio Martí, former Cuban Air Force Deputy Chief, General Rafael del Pino, who defected in 1987, reported that all the planes flying over Cuba that veered off from the approved air corridors for commercial and private aircraft, had to be cleared with the office of Raúl Castro at MINFAR. In a program broadcast over Cuban TV on the Ochoa trial, one can see an indignant Fidel Castro calling SOBs those who pointed out Raul’s involvement in drug trafficking. But his indignation does not explain away the truth: only Raúl Castro had overall command of the armed forces which allowed the smugglers to land in Cuba and provided them radar assistance and protection from U.S. Coast Guard vessels. But the most worrisome of all the indictments for Castro was the one that ended in the conviction, on April 23, 1989, of Reinaldo Ruiz and his son Rubén. Reinaldo Ruiz was a cousin of Captain Miguel Ruiz Poo of Cuba’s Ministry of the Interior. The Ruizes were allowed by Cuban authorities to land their plane at the Varadero Beach airport for refueling after dropping their drug cargoes off the Cuban coast near the Bahamas. Drug smuggling motorboats (lancheros), would come from Florida to pick up the cargoes. Cuban Coast Guard radar monitored U.S. Coast Guard cutters and helped the lancheros evade them. These four indictments provide ample evidence, from U.S. judicial sources, that the Castro regime, at the highest level, has been involved in drug activities. It has been claimed that these activities may have been undertaken by rogue Cuban government officers on their own and without Castro’s knowledge or, much less, approval. No one who has the most limited inkling of how the Cuban regime works could give credit to this explanation. True, Castro wants the world to believe there is such a possibility because he is in utmost fear of meeting the Noriega fate. As will be shown in the next section, the search for a way to deny any potential Castro involvement in drug traffic was one of the reasons for the Ochoa trial. In order to avoid falling into the trap of reductionism to a single cause, however, it is acknowledged that the need to dispose of an emerging highly popular rival also played a role. Ochoa’s actions reveal the intention to challenge Castro’s power monopoly in many arenas: in Cuba’s relations with the Soviets, in directing military operations overseas and in managing the drug traffic. The implications of the last U.S. indictment mentioned above, the Ruiz case, require some amplification because it is the central event leading to the Ochoa trial. It is precisely the use of Cuban air space and refueling facilities, as well as the provision to drug smugglers of radar support to evade the U.S. Coast Guard, that were two of the central issues raised during the trial against Ochoa. This, despite the fact that, at no time during that period, was Ochoa in command of the forces involved in controlling Cuban air space, territorial waters or shores in the areas where these operations were taking place. However, this does not exonerate Ochoa. He just did not realize the consequences of becoming entangled with Ministry of Interior operations fully approved by Fidel Castro and directed by his brother Raúl. Once discovered, Ochoa, along with some other key operatives, were made sacrificial lambs to save Castro’s good name and the reputation of the revolution. Radio Martí was able to interview Reinaldo Ruiz in prison in the United States shortly after he was sentenced in 1989. We were informed we had to wait for the sentencing to avoid the implication that what he said was the result of some plea bargaining. In the interview with our reporter, Ruiz explained that he had been involved in a MININT people-smuggling operation through Panama and wanted to use the operation to get some of his relatives out of Cuba. It was while he was engaged in this effort that he claims he was approached by his cousin, Captain Ruiz Poo, to use his people-smuggling network for drug smuggling into the United States. At the time, Captain Miguel Ruiz Poo was working for the Convertible Currency Department (MC) of Cuba’s MININT, which was headed by Colonel Tony de la Guardia, another of the officers executed by Castro. Reinaldo Ruiz claims he agreed to the proposal after some hesitancy. His son flew as copilot of the planes landing at Varadero and he himself went into Cuba on various occasions, enjoying VIP treatment from Cuban authorities. Reinaldo Ruiz stated that, in some occasions, the Cubans even took him to Havana as a government guest. Mr. Ruiz claimed in the interview that he had no doubt that what he was doing had the approval of Castro. As an exile, he would have never taken the risk of going into Cuba had he had any doubt about who was behind those activities. A most plausible explanation. But the Ruiz operation had been infiltrated by the U.S. Drug Enforcement Administration (DEA). The pilot of the plane was an undercover DEA agent and he recorded in videotape many of the conversations they had. The United States requested the extradition of Reinaldo Ruiz from Panama early in 1988. According to Reinaldo Ruiz, he was surprised when Panama granted the request. However, he was convinced all along that the Cubans would get him out somehow before his being convicted. According to the Norberto Fuentes report, Fidel Castro considered this setback was a consequence of Raúl’s incompetence in handling the operation. As far back as 1980, the Minister of Interior, at the time Ramiro Valdés, stopped marihuana smuggling operations ordered by Fidel when Castro refused to issue written orders to him to undertake them. In early 1983, the Minister of Interior ordered Tony de la Guardia to make a feasibility study for a drug money laundering center at Cayo Largo, south of Cuba, and de la Guardia was also asked by Fidel to establish contacts with Pablo Escobar, the Colombian drug cartel head. Castro initially delayed a proposal from the Colombian M-19 movement to engage in an exchange of weapons for coca because the proposal had been addressed directly to him by Jaime Bateman. Evidently, after Bateman’s death in an airplane accident, a more discreet arrangement was made— leaving Castro out of the loop; this arrangement was brought up before the above mentioned Guillot Lara Grand Jury. In the Fall of 1983 Fidel told Abrantes, who was really acting as Minister of Interior, and two MININT officers, José Luis Padrón and Tony de la Guardia, that he wanted to be shown the feasibility of undertaking drug operations while overcoming three obstacles: (1) the requirements established by Ramiro Valdés of written orders, (2) the clumsiness of the Chief of the Navy, Aldo Santamaría and other Raúl collaborators, already indicted in the United States; and (3) the level of formal commitment expected by the Colombian M-19. In other words, as Fidel Castro was moving towards expanding his involvement in the drug traffic, he wanted to ensure deniability for himself. When Reinaldo Ruiz was convicted on April 23, 1989, the contents of some of the videotapes recorded by the DEA undercover agent were given ample coverage by mass media, among them one in which Reinaldo Ruiz is seen saying that the money they were paying “went straight into Castro’s drawers.” He also alleged that, on one occasion, while they were waiting at the Varadero Airport tarmac, Raúl Castro was at the airport and one of his bodyguards approached them requesting marijuana. One can imagine the panic this caused among Fidel Castro and his collaborators. Neglect of the fate of a low minion in the drug operation being run by Cuban intelligence all of the sudden had entangled directly the revolutionary leadership. And in an American court of all places. Plausible denial was no longer credible. According to one of the Cuban TV tapes of the Ochoa trial, it is precisely on April 24, 1989, the day after the conviction of the Ruizes, that Captain Miguel Ruiz Poo got a call from Major General Abelardo Colomé, a close collaborator of Raúl Castro, who is now Minister of Interior and at that time was head of MINFAR intelligence, inquiring about what was going on. In his testimony, Colonel de la Guardia stated that he tried to calm down Captain Ruiz Poo by explaining that General Colomé was inquiring about the status of collections from the operation. It is this conversation that led to the dramatic testimony seen later on in the TV program covering the trial, showing Captain Ruiz’s pathetic effort to save himself by referring to comments by other accused officers about higher ups being involved in the drug operation. After Captain Ruiz started sobbing uncontrollably on the witness stand, he is hurriedly removed from the court and the next day he is not allowed by the prosecutor to expand on his statement, while other witnesses are brought to deny that any involvement at the highest level was ever discussed and to question that anybody had grounds to even think of such a possibility. The reaction to the highly emotional revelation of a clearly terrified witness reveals that involvement by higher ups was central to the rationale for the trial. One version of the Ochoa trial, which reached Radio Martí at the time, was that Ochoa was preparing to challenge Castro. He had some encouragement from the Soviets — Gorbachev had visited the island earlier in 1989, and was not very pleased with Castro’s defiant stance towards glasnost and perestroika. General Ochoa twice attended Soviet military schools and developed close links with Soviet generals when he commanded Cuban forces in Ethiopia and Angola. According to this version, knowing about Castro’s plans to cooperate with the drug cartels in exchange for massive investments in Cuban tourism, Ochoa sent his aide Captain Martínez, also later executed by Castro, to meet Pablo Escobar in Colombia to get evidence for the challenge he was planning. • more worrisome of all, had established his own connection to Pablo Escobar to engage in drug operations. This last issue involved a project to build a coca laboratory in Angola in association with Pablo Escobar. Ochoa had asked Tony de la Guardia to take charge of developing a marketing network in the United States and Western Europe for the output of this enterprise. Up to that time, the drug smuggling operations undertaken by Tony de la Guardia on behalf of the Ochoa/Escobar group, which had started early in 1987, had generated small amounts of money — the rate was about US$1,200 per kg of coca — and had been aborted on several occasions due to sabotage, apparently encouraged by Castro. As a result, Ochoa was moving to set up his own smuggling operation independent of the MC Department of MININT. From the Fuentes report, it is evident that Castro was engaged in many simultaneous drug smuggling arrangements. In the end, Fidel emerges as a distant Godfather, always in the background, having the final say in deals with Vesco, Lehder and others. Some of the deals proposed involved substantial amounts. For example, through one of Tony de la Guardia subordinates, Lt. Col. Rolando Castañeda Izquierdo, Carlos Lehder proposed a US$7 million a week arrangement for regular shipments. That would generate a flow of US$364 million a year. In another deal, Abrantes, under Fidel’s orders, instructs Tony de la Guardia to find buyers in Europe for US$50 million in coca. Deals of these magnitudes could explain how Cuba finances the gap in its balance of payments. Of all the sins of Ochoa, challenging Castro as the Cuban Godfather was his worst offense. It was not only a threat to Castro’s absolute rule, it also endangered his careful efforts at covering up Cuba’s involvement in drug smuggling. The Ruizes sentence precipitated events. With his obsession to give a legal cover to the most arbitrary actions he wants to undertake, Castro decided to orchestrate a trial to eliminate the threat Ochoa presented to his leadership of the regime and, in the process, to cleanse himself from any involvement in drug traffic. To ensure their silence, he executed the four that not only knew about his entanglement with drug trafficking, but were closely involved in Ochoa’s operations. Later on, he would also get rid of the Minister of Interior, José Abrantes. Abrantes was dismissed as a result of the Ochoa trial, but not because he was involved with Ochoa. Quite the contrary. He was the executor of Castro’s orders in relation to drug operations. It is quite possible that Raúl saw in the whole mess the opportunity of bringing the MININT under this control. He was able to do so by placing General Abelardo Colomé, one of his most trusted officers, in charge of the MININT. After his dismissal, Abrantes was tried and sentenced to prison for omission in preventing the corrupt activities of his subordinates. While in prison in Guanajay, on January 18, 1991, he had a confrontation with General Patricio de la Guardia, Tony’s twin brother and also one of the defendants at the Ochoa trial sentenced to prison. According to the Fuentes report, Abrantes told Patricio that “Fidel had authorized everything. Patricio was indignant upon the confirmation that his brother was executed for having undertaken tasks ordered by Fidel.” On January 21, 1991, three days later, Abrantes died in prison. The newspaper Granma reported he had a heart attack. Actually, it is reported he died as a result of an overdose of a heart medication he needed, a frequent outcome in Cuba’s jails. The defendants in the Ochoa trial serving time in prison got a warning: revealing the involvement of Castro in the drug operations could be a fatal indiscretion. Meanwhile, as recent events reveal, Castro continues tolerating drug traffic through Cuba, the crime for which he executed Ochoa, free of any local competition in his role as Godfather. ARE THE DRUG CARTELS INVESTING IN CUBA IN EXCHANGE FOR CASTRO’S SUPPORT? Cuba does not generate the savings required to finance investments. Since hotels are reported to be built with Cuban funds, one logical conclusion is that Cuba is a huge money laundering center for the cartels. After all, wasn’t this Ochoa’s plan? We will elaborate on this hypothesis using the figures provided in the ECLAC report. Except the estimates for hotel investment in dollars and their conversion to Cuban pesos, all the figures in Table 3 are taken from the statistical annex of the ECLAC report. Since no table is provided in the ECLAC report for the flow of remittances, and the US$ 800 million figure is mentioned only in the text, no equivalent numbers are available to compare for the years covered in the above table. Some questions may be raised on the use of a rate of 20 pesos for US$1 for the conversion of the investments to current Cuban pesos. As can be appreciated from the last line, if anything, this rate underestimates the pesos equivalent which in 1993 reached 100 to the dollar. Therefore, it provides a conservative conversion to Cuban current pesos. According to the tables provided in the ECLAC report, Cuba built 14,000 international-quality hotel rooms between 1990 and 1996. The ECLAC Report acknowledges that these hotels were built with Cuban financing. The benchmark figure for hotel investment in the Caribbean is between US$100,000 and US$125,000 per hotel room. Applying the lower figure to allow for lower construction labor costs in Cuba we arrive at a total investment during the period of US$1.4 billion. The amount of dollars required would be lower if Cuba could provide more inputs; however, the collapse of Cuban industry since the end of Soviet assistance does not allow for use of local components other than labor, cement and perhaps some steel bars for concrete structures. International quality hotels require equipment above Cuban production standards. According to ECLAC, even food items for tourism, such as eggs and chicken, are imported due to the poor quality of Cuban production. The contradictions and inconsistencies these figures reveal are related to the relation between investment in hotels and total national investment and savings reported in the national accounts. As can be observed, the peso equivalent of the hotel investment for each year exceeds the figures reported by ECLAC in its report for both gross domestic investment and national savings. More so, when we consider that hotel building is not the only national investment. However, there is an unquestionable fact: hotels have been built. As mentioned above, the information on foreign investment provided to The Economist Intelligence Unit did not include hotel investment either. The question is why do the aggregate figures from national accounts not reflect those investments? Unless there is some explanation resulting from the techniques followed for computing the national accounts, the only possible explanation is that financing for these investments has been handled outside the conventional national accounts: money laundering or drug trafficking. WHAT IS THE EVIDENCE SUPPORTING THE MONEY LAUNDERING HYPOTHESIS? Here is where money laundering enters as a plausible explanation for how investments in hotels are financed. First, there is the coincidence that the massive expansion of tourism hotels starts precisely the year after General Ochoa was executed. As commented above, a hypothesis is that Ochoa had uncovered this scheme and was trying to document it to justify his challenge to Castro. Second, the other, more credible, hypothesis is that Ochoa was trying to become a Castro rival as a capo in drug smuggling. Whatever the actual explanation is, when Castro discovered what Ochoa was up to, he decided to turn the tables on him and use the accusation of dealing with the drug lords to discredit Ochoa and justify his execution. Castro’s involvement with the drug lords is more than documented by the four grand jury indictments mentioned above. And this involvement did not end with the Ochoa trial. The arrest of Jorge “Gordito” Cabrera, with a photo with Castro, raises the possibility Castro was considering gaining some influence, a la Chinese, with the Clinton Administration. The cocaine shipment seized in Colombia in December 1998, after seven or eight previous ones, owned by foreign investors who were partners in a joint venture with the Cuban government could take place only with some previous clearance by Castro himself. The fact no regime official has been fired or prosecuted for acting on his own, points to Castro as the approving authority and not the doings of some rogue officer. It is evident drug smuggling has survived the Ochoa execution, and so has money laundering, but following another track. It has been established by the DEA that the weight of the money generated by drug sales exceeds the weight of the drugs themselves. Therefore, disposing of the money involved in the United Sstates alone — with retail sales estimated at more than US$100 billion annually — is a process of industrial proportions. Trailer trucks cross the U.S.-Mexico border with full cargoes of U.S. currency. According to a 1997 report on money laundering in The Economist, the fee at that time for helping the cartels launder their money had increased to between 25 and 28 per cent.15 In the argot of the money launderers, this is called “discounting,” the cost of making a drug tainted dollar a tradeable dollar. Ironically, through the prohibition of legal remittances in 1996, the U.S. Government provided an excellent cover-up for money laundering. Money started reaching Cuba through so-called “mules.” That is, people who traveled to Cuba through third countries carrying tens of thousands of dollars in cash. By depositing these monies in Cuban government accounts, or, more likely, in the accounts of the Comandante’s reserves, the money is legitimized. The death of the Lord of the Skies, Amado Carrillo Fuentes, has lifted the veil of another potential avenue for money laundering. According to a report published by The Miami Herald, Mexican authorities have obtained evidence that Carrillo Fuentes was a guest at a protocol house of the Cuban government during his frequent visits to the island. There is speculation that among the alleged activities taking Mr. Carrillo Fuentes to Cuba was money laundering.16 Authority for assigning protocol houses is vested exclusively on Fidel Castro and his Chef de Cabinet, Dr. José Miyar Barruecos, is responsible for their administration. Finally, Cuban defectors have mentioned that, among the attractions offered to drug dealers visiting the Cayo Largo resort, a key south of the island of Cuba, is the existence of banking facilities where money laundering is performed. As was mentioned above, Tony de la Guardia was the MININT officer commissioned to undertake the feasibility study to make this key a money laundering center. This analysis offers only an inkling of what is going on. There is no doubt that there is a huge flow of laundered money worldwide and that Cuba is one of the channels being used. It is also evident that in Cuba nothing of this sort can go on without Castro’s personal approval. The hypothesis that large volumes of remittances cover the huge gap in Cuba’s balance of trade stands on weak foundations. The available evidence indicates there is an impossibility of the remittances option offering the main source to finance whatever is the balance of trade gap. As to other sources, there is substantial evidence to conclude that Cuba is engaged in drug smuggling and money laundering. This is a huge growing gap, as is shown in the previously mentioned Table 5 of Jorge Pérez-López’s paper, which in 1998 registers a trade gap amounting to US$2,785 million. Therefore, even accepting the US$800 million estimate for remittances, there are two billion dollars more to explain. However, there is not enough data to estimate the magnitude of the resulting financial flows. All we have is a simple rule of thumb to calculate how that gap may be met through money laundering and drug smuggling. Thus, to meet the balance of trade gap, Castro needs four dollars in money laundering transactions for each dollar in net proceeds and to smuggle a kilogram of coca for each US$1,250. Back in 1989, the U.S. Coast Guard had reports of about 300 flights per year outside of the approved air corridors over Cuba for private and commercial flights. It is such flights that make the coca drops to be picked up by the lancheros. At some future time, reliable estimates on drug trafficking volume may be available and it may be possible to combine the data on volume with estimates of transshipment charges and money laundering fees to compute estimates of the involved financial flows. But the lack of data for quantification should not deter us from considering that drug trafficking and money laundering are the most plausible sources for financing the Cuban balance of payments gap. 1. Jorge F. Pérez-López, “Cuba’s Balance of Payments Statistics,” in this volume. 2. Ernest H. Preeg, “U.S. Embargo: The Illusion of Compliance,” The Washington Post, November 2, 1997. 3. CEPAL, La economía cubana: Reformas estructurales y desempeño en los noventa. LC/MEX/R.621 (Agosto 26, 1997), pp. 89 and 107. 4. Monreal, Pedro, “Las remesas familiares en la economía cubana,” Encuentro, Issue No. 14 (Madrid, Fall of 1999). 5. Emily Morris, “Interpreting Cuba’s External Accounts,” in this volume. The quoted text is from an earlier version of Morris’ paper. 6. Sergio Díaz-Briquets, “Emigrant Remittances in the Cuban Economy: Their Significance During and After the Castro Regime,” Cuba in Transition—Volume 4. Washington: Association for the Study of the Cuban Economy, 1994. 7. CEPAL, La economía cubana, pp. 89-90. 10. Don Van Natta, Jr., The New York Times, April 4, 1997. 11. Robert Novak, Chicago Sun-Times, Syndicated Column, dated February 4, 1999. 12. Marcelo Fernández-Zayas, “Cuba and Spain: Corruption, drugs and espionage,” Mundo Latino, February 22, 1999. 13. Sam Dillon and Craig Pyes, “Court files say Drug Baron used Mexican Military,” The New York Times, May 24, 1997. 14. DevTech Systems, “The Comandante’s Reserves,” Cuba Monthly Economic Report, Vol. 1, No. 4, August, 1997. 15. “Dirty Wars in money laundering,” The Economist, Special Report, pp. 19-21, July 26th-August 1st, 1997. 16. Andrés Oppenheimer, “México probes drug lord’s Cuban connection,” The Miami Herald, September 9, 1997.